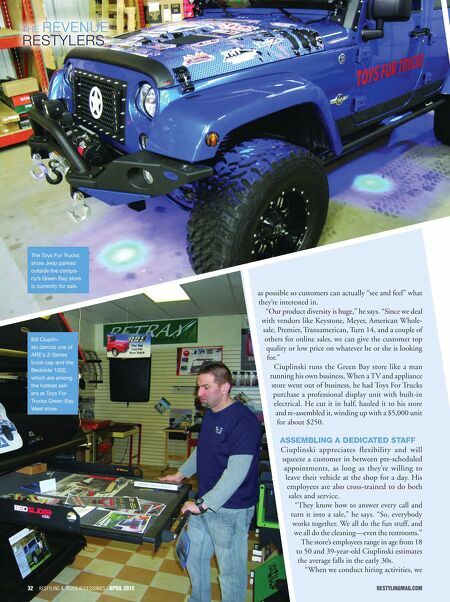 restylingmag.com April 2015 | Restyling & tRuck AccessoRies 33 advertise online in places like Craigslist, and we also go through Wisconsin Work- force Development." Ciuplinski says he attempts to hire people who have a passion for vehicle upfitting. "You get a stock vehicle and upgrade it and when the customer picks it up, you feel pride in your job," he says. "Working here there's something new everyday—our employees like coming to work." 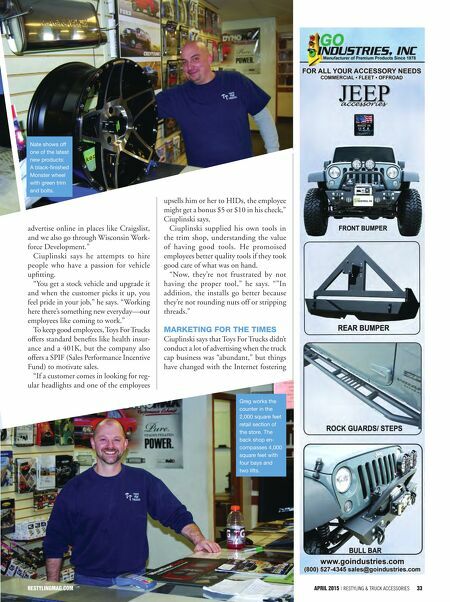 To keep good employees, Toys For Trucks offers standard benefits like health insur- ance and a 401K, but the company also offers a SPIF (Sales Performance Incentive Fund) to motivate sales. "If a customer comes in looking for reg- ular headlights and one of the employees upsells him or her to HIDs, the employee might get a bonus $5 or $10 in his check," Ciuplinski says. Ciuplinski supplied his own tools in the trim shop, understanding the value of having good tools. He promoised employees better quality tools if they took good care of what was on hand. "Now, they're not frustrated by not having the proper tool," he says. ""In addition, the installs go better because they're not rounding nuts off or stripping threads." Marketing For the tiMes Ciuplinski says that Toys For Trucks didn't conduct a lot of advertising when the truck cap business was "abundant," but things have changed with the Internet fostering restylingmAg.com Nate shows off one of the latest new products: A black-finished Monster wheel with green trim and bolts. Greg works the counter in the 2,000 square feet retail section of the store. The back shop en- compasses 4,000 square feet with four bays and two lifts.